1 : Apply a base coat and let dry. It’s important that it is completely dry before you proceed. Then Apply either blue painter’s tape or paper reinforcements to your nail. 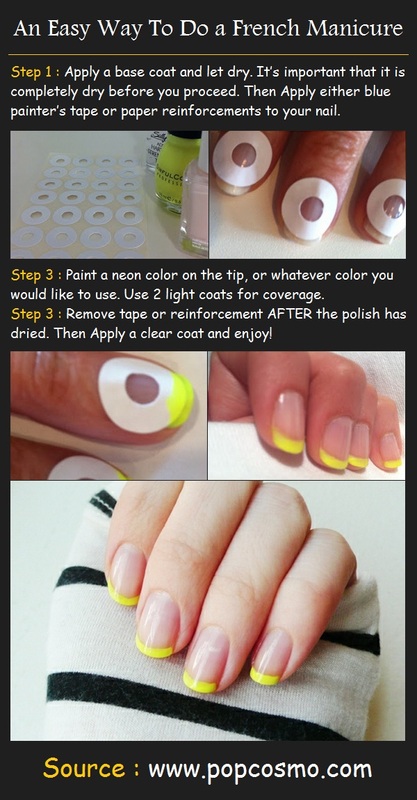 3 : Paint a neon color on the tip, or whatever color you would like to use. Use 2 light coats for coverage. 3 : Remove tape or reinforcement AFTER the polish has dried. Then Apply a clear coat and enjoy!